WE Bike NYC is organizing ten women from five organizations to ride 262 miles on bicycles from New York City to Washington, DC to represent their communities at the nation’s largest annual bicycle advocacy event, the National Bike Summit on March 3, 2014. WE are so pleased to be supported by WomanTours, Bicycle Times Magazine, Pearl Izumi, Velojoy, and InTandem, and Transportation Alternatives. 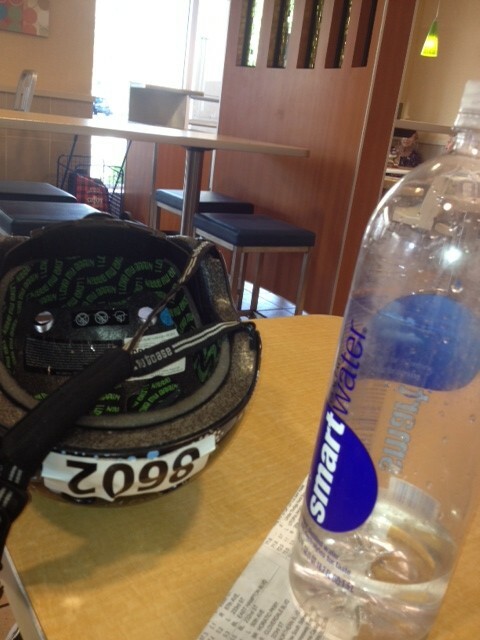 For more about the ride, check out our fundraising page HERE! Now that you have gotten to know who we are, learn more about us and our process. WE will be rolling out a series of guest posts from our riders and sponsors. Tina is a woman with gumption. 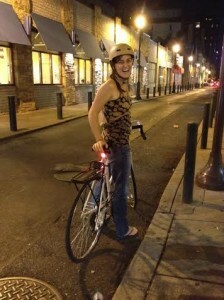 After not having ridden a bicycle since she was a kid, she showed up to a Women’s Urban Riding Basics class at the Bicycle Coalition of Greater Philadelphia office last year and sat through an hour of classroom-style advice about how to ride a bike in the city (offered by yours truly). 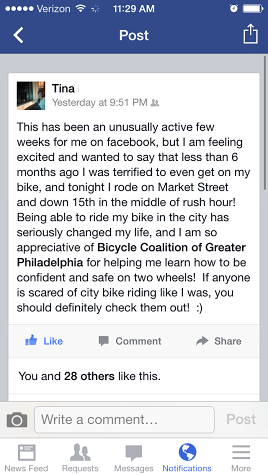 She also showed up to an Adult Urban Riding Basics class offered by the Bicycle Coalition in Eakins Oval, and after a few minutes of wobbling, she totally had her balance back and was pedaling with confidence. Next, she came to a women-and-bikes potluck Women Bike PHL held, modeled after Nelle Pierson’s Women & Bicycles Program in DC, and we talked through a few more questions about biking in the city (over some delicious food). Lastly, she came on a Women Bike PHL ride to a First Person Arts storyslam at World Cafe Live and mastered Philly’s weird left-side-of-the road bike lanes on Walnut Street. 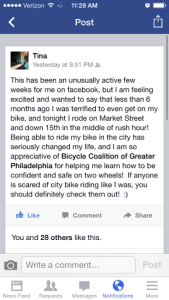 Tina is an example of what programs like Women Bike PHL can do — they create spaces where women feel comfortable learning the skills they need to embrace a whole new transportation option. I’m so excited for her, and I hope I can help lots more women achieve what she did in 2014.